We are witnessing a major shift in attitude when it comes to cloud adoption. 451 Research estimates that 90 percent of companies will be in the cloud by 2019. Furthermore, the cloud category is the fastest growing HPC category at 14-18 percent. New frameworks, containers and cloud are changing how enterprises look at technical computing, to name a few factors. Yet what does this mean for the on-prem HPC users looking to migrate to the cloud? This webinar will discuss the shift that digital leaders are making to move faster toward off-premises IT – resulting in accelerated business and IT transformation. 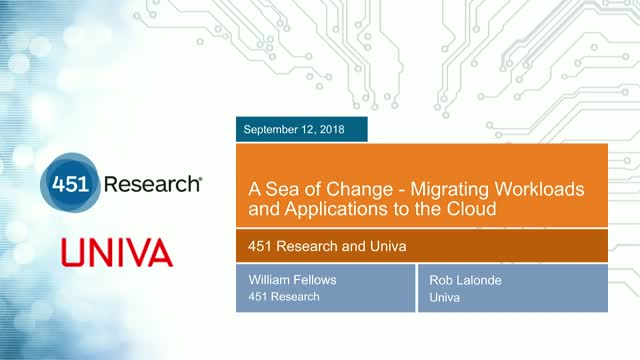 It will also cover how Univa is helping its customers migrate their HPC workloads to the cloud, to include some unique hybrid cloud bursting case studies.